Taste and feel free to adjust the ingredients, increase salt or vinegar etc. 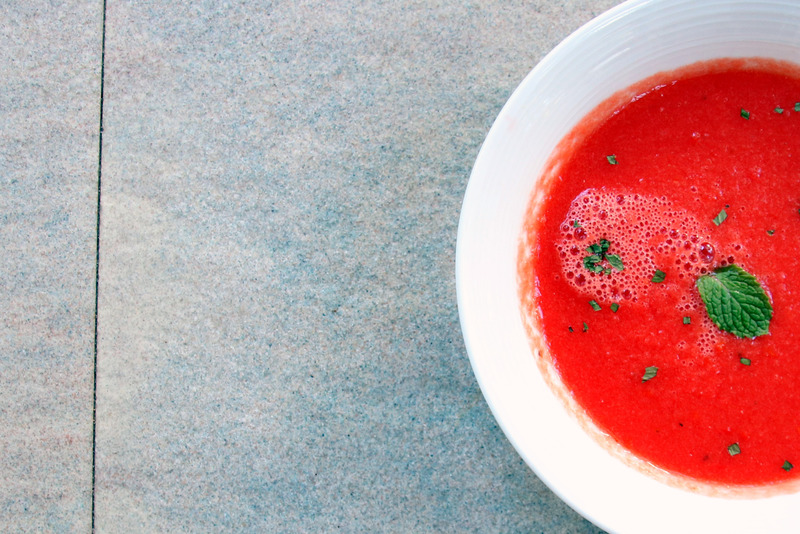 Gazpacho – ‘the soup-salad of Spain’ dates back to when Spain was part of the Islamic world. Traditionally made with mortar and left over bread that was about a week old. 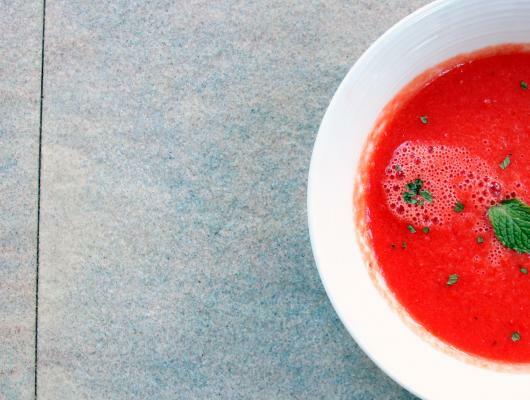 When I first met the hubby one of the things he loved to make up was a big pot of tomato gazpacho, for me it was hard to understand why you would want to blend so many vegetables in one soup rather then just simply eating a salad. The more I drank it, the more the flavors came into harmony on my pallet and now it’s a weekly staple at the table. The sweet fresh taste coupled with the high nutritional content makes this soup-salad perfect for summer bbq’s, kids parties, picnics and a whole lot more. *Watermelon; instead of this sweet taste you could switch up the watermelon to tomatoes which makes it a lot more salty and acidic taste. Another fruit that works well is strawberry, but its got the small black seeds so the texture also change a bit of the soup. Watermelon; although it’s 92 percent water – is full of vitamins, lycopene (important for cardiovascular health), antioxidants, potassium and amino acids. It’s digests easy and leaves your system feeling light and fresh. According to Ayurvedic food combinations it is believed that when light fruits are eaten alone they digest well but if you eat other heavy hard to digest food then the watermelon has to wait till the other food has digested and often can cause gas and indigestion as it starts to ferment in the system.